Johan Blankenberg of Cape Town asks about a rare incident on a rugby field. It must be rare as I have not seen or heard of it in 73 years of involvement in rugby on all the continents. But let him ask his question. Question: Is it legal for a player to deliberately headbutt a ball over the dead ball/sideline to prevent a try from being scored. The ball had been grubbered through and the wing chased the ball. The opposing team's fullback came cross in defence but the ball bounced upwards and he jumped to headbutt the ball out just as the wing was about to grab the ball to score a try. Is this legal? There is a short answer, which we'll come to but let's look at the law, as it now stands, for that short answer. Intentionally knock, place, push or throw the ball with arm or hand from the playing area. It is legal because it was not done with hand or arm. That makes things more straightforward, as it limits options and usually means that a deliberate act is more obvious. In the early days of the game in its various forms, there were no touchlines - just boundless meadows and hills. Touchlines came when the game was played on fields, as at Rugby School. This kept spectators back but the existence of touchlines brought laws/rules. But for about a century there was no law prohibiting throwing the ball into touch. But those of the days of the manly game, where you stood chest to chest and hacked away at the lower legs, without showing any sign of pain or fear. One did not funk. Throwing a ball away because threatening opponents were bearing down would be a horrible sign of funk. It came into law only in 1912: If a player shall wilfully pass, knock or throw the ball into touch, the opposite side may claim either a free kick or scrummage. In 1937, the compass of the illegal play became wider: If a player wilfully knock or throw the ball from field of play into touch, touch-in-goal or over his own dead-ball line, the opposing team shall be awarded a penalty kick at the place where such knock or throw occurred. In 1948, things were made a bit clearer: A player may knock or throw the ball into touch-in-goal from in-goal provided it is not knocked or thrown forward. That survived till 1982, which must be close to a record. Law 26.2 (c) It is illegal for any player wilfully to knock or throw the ball from the field-of-play into touch, touch-in-goal or over his dead-ball line. Law 26.2 (c) It is illegal for any player wilfully to knock or throw the ball from the playing area into touch, touch-in-goal or over his dead-ball line. Spot the difference? Field-of-play has become playing area. 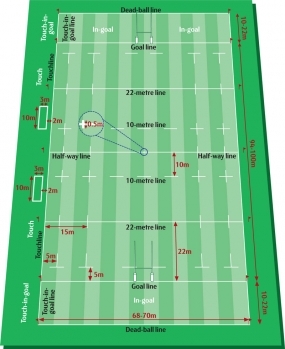 Law 1 The field-of-play is the area bounded by, but not including, the goal lines and touch lines. The playing area is the field-of-play and in-goal. That means it is no longer legal to throw the ball from in-goal into touch-in-goal or over the dead-ball line. And that is how it is now. If you do deliberately throw the ball into touch, what will the referee do? -Into touch or touch-in-goal or over the dead-ball line from the playing area, the mark is where the infringement occurred but no closer than 15 metres from the touchline and five metres from the goal line. -Into touch or touch-in-goal from in in-goal, the mark is on the five-metre line at least 15 metres from the touchline. -Over the dead-ball line from in-goal, the mark is on the five-metre line in a line with where the infringement occurred. It doesn't happen all that often but it can be a complicated little rarity!